Liverpool’s 4-0 win over Bournemouth saw Andrew Robertson repay his manager’s faith in him with a much-needed standout performance. The summer signing made his fourth straight start in the league and took significant strides towards finding his feet with the Reds. Besides helping his side keep a valuable clean sheet away from home, the Scot proved to be a useful attacking outlet down the left-hand side. 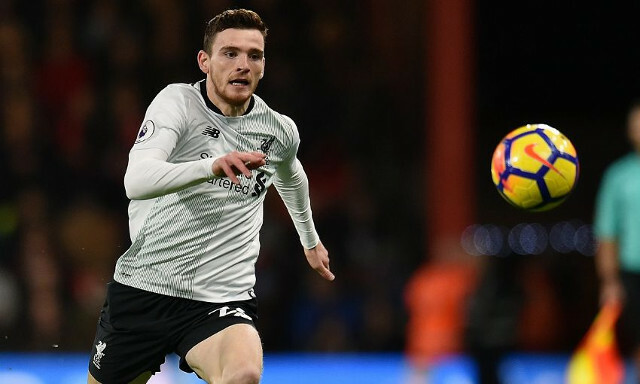 Jurgen Klopp was quick to praise Robertson for his progression after a tough start to life on Merseyside. “He didn’t have to wait, he had to train and to learn, that’s a different thing. Only because everyone is asking it looks like he has to wait,” Klopp told Liverpoolfc.com. Robertson’s first-team opportunities have been somewhat limited since his arrival at Anfield, with Alberto Moreno’s resurgence having seen the Spaniard consolidate his starting spot at left-back. With Moreno injured, the former Hull City man has filled in impressively and made the most of his chance to stake a claim for a regular place in the team. Sunday’s win marked Robertson’s strongest performance for the club yet as he proved to be effective assistance for Philippe Coutinho down the left flank. It was Robertson’s selfless run in the first half that drew Bournemouth’s defenders wide to create the space for the Brazilian to cut inside and fire Liverpool into the lead. Another step in the right direction ahead of a big test against Arsenal.